The Cleanwaste WAG Bag Toilet in a Bag waste kit is a biodegradable double bag system made from puncture resistant materials. Each waste kit includes a zip close disposal/transport bag, a waste collection bag preloaded wiith Poo Powder waste treatment, toilet paper and a hand sanitizer. Non-toxic Poo Powder waste treatment treats up to 32 ounces of liquid and solid waste allowing for multiple use. It turns liquid waste to a solid for hygenic and spillproof transport. The Poo Powder waste treatment controls odors and contains a decay catalyst that breaks down solid waste. 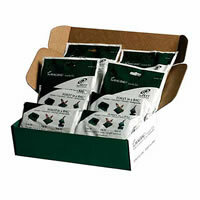 The Cleanwaste WAG Bags waste kits are biodegradable and approved for landfill disposal. 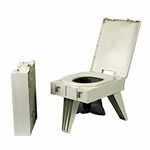 Designed to be used with the Cleanwaste Portable Toilet, they may be used by themselves, in a standard toilet, or an RV or camping toilet. Simply remove all liquids and chemicals from the toilet prior to use. 12-Pack weighs 3 lbs. WAG stands for "Waste Alleviation and Gelling." WAG BAG waste kits include one large waste bag, a resealable disposal bag, a small fold of toilet paper, a hand sanitizer and a proprietary waste-treatment powder mixture. The powder is made up of an organic decay catalyst, a perfume-free odor neutralizer and a non-toxic polymer-based absorbent (similar to what's in baby diapers) that gels liquid waste and encapsulates solid waste. 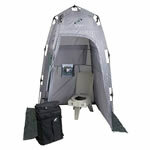 WAG BAGs are designed to work with the Cleanwaste folding toilet (too bulky to fit in most kayaks), and a variety of other outdoor waste systems (including some reviewed here). They are very easy to use on their own‚you just spread the waste bag out and squat. The puncture-resistant bags are large enough to wrap around your rear end, ensuring full privacy and a no-splash zone. Once you have done your business, twist the bag up, pop it inside the smaller disposal bag and stash it away in whatever container you have. WAG BAGs are biodegradable and approved for landfill disposal. I found the WAG BAG so reliable and simple, I could use it inside my tent. Each bag can take 32 ounces (960 ml) of liquid and solid waste, so there's plenty of room for multiple use. WAG BAGs are available online and from most outdoor stores. They are permitted by the U.S. Bureau of Land Management for use on rivers and in wilderness areas where toilets are required.